Thank goodness for favorite uncles. Haha yeah! They’re not all evil murderers. Darn you strategically placed speech bubble! I don’t have any suggestions for your store, but I love that Ezio print. IT’S THERE. Though even if it wasn’t, you’d only see the back of a head. I’m gonna go be suspicious until next Thorsday. Ibrahim’s dad seems more elusive and mysterious every week! In Farsi (Iranian) there are two words for Uncle and two words for Aunt: Amu is the father’s brother; Ameh is the father’s sister; Daui (dah-ee) is the mother’s brother; and Khaleh (“kh” tends to be unpronounceable unless you grow up with it) is the mother’s sister. Also, family friends get called Uncle and Aunt a lot, though which term used varies. Although I don’t know how the words differ in Arabic. Sorry, it’s just rare I get to see people from this half of my cultural background in comics, and I’m super excited and stuff. It’s not quite a squee. Okay there might be some squeeing. But it’s mostly on the inside. Aw, thank you! I’m glad you’re excited! It’s definitely fun to shine a light on other cultures. I only hope I do them justice. 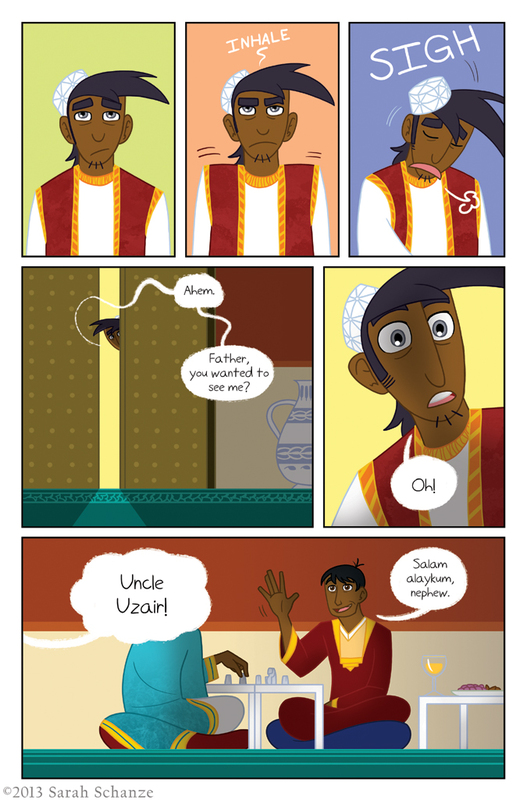 And Uzair is Ibrahim’s paternal uncle, so I guess he’d be Amu Uzair! Omigosh you could shorten that to Amuzair. How cute! there is something ominous in the fact the phylactere is hiding the face of our young hero’s father? Odin’s avatar? I find the uncle to have something of Loki and Odin and Loki being blood brothers, it would make sense our young man to call Loki’s avatar uncle??? Just thinking, just thinking? and clutching at straws! Hahaha, I’m afraid you’re just clutching at straws. XD Ibrahim’s dad is an ordinary human. I’m a master at procrastination suspense. Hrmm, “apple juice” you say. Are you sure that isn’t a glass of delectable Sherish (known today as Sherry) which originates in al Andalus and was based on a style made in the region of Shiraz in Iran? Yeah alcohol is forbidden by Sharia but imbibing still went on in much of the Islamic world anyway, just out of the public eye. People gotta have their booze. Whaaaaaaat? I didn’t know sherry came from al Andalus! (Now you know how much research I’ve really done) That’s neat. And I figured they drank anyway, but I don’t really want to say one way or another just in case. It’s whatever drink you want it to be! From Shiraz Iran, we get the name of Jerez Spain, and onward to Shiraz wine, Syrah wine and Sherry. If you go to Spain I highly recommend visiting Jerez and touring a sherry bodega (obviously followed by a tasting). Aw, still in suspense until we see dad’s face next week! Ah! Thank you so much for getting the print! I hope it looks good, I haven’t seen my stuff printed. Colors can definitely look different on a screen than on a piece of paper! Hahah, yeah it’s a hard conversation! Thank you! Now this looks like a nice guy! He is nice! He is a nice guy. I would like it if you put up a print for some more of the chapter title pages. They are really beautiful. I bet others would like it too. Oh, really? Thank you! I thought of that, but I wasn’t sure which to put up. Some were more involved than others. I’ll have to give them another look-through! first time I saw the picture I thought Uzair was his father but then I realized Ibrahim’s father was the one with a word bubble over his face. Hahaha, I’m just a little stinker. All you’d see is the back of his head anyway. Hello. First time I comment here.